Keith Williams, arts and architecture journalist Gillian Darley, architect Steve Tomkins and theatre consultant Richard Pilbrow of Theatre Projects Consultants will discuss how theatre architecture has developed over the last 50 years. The event will take place as part of the National’s 50th Anniversary Celebrations, in The Shed at the National Theatre, 1.05 on Tuesday 1st October. The debate is part of the National’s lunchtime discussions and will take place in the National Theatre’s Shed, a temporary red painted theatre venue on the London’s South Bank, in place whilst the National Theatre’s latest refurbishment programme is under way. 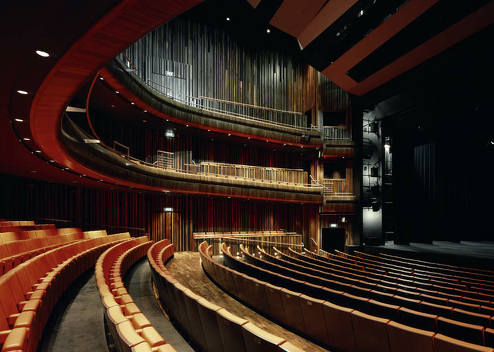 One of the world’s most renowned and highly regarded theatre complexes, the Grade II* listed National contains three performance spaces, the Olivier, the Cottesloe and the Lyttelton together with extensive backstage support, rehearsal rooms and workshops and public areas. The Neo-Brutalist complex was first opened in 1976 to the designs of Sir Denys Lasdun with innovations that would set the industry standards for years to come and mark the rediscovery of the courtyard theatre form.